Tim Shore officially completed his metamorphosis from banker to woodworker Dec. 31. That’s when he quit his day job to dedicate his full time and energy to manufacturing wood stand-up paddle boards. Shore’s transition from banking to custom woodworking had pretty much been in the works since 2013 when he got inspired to make a wood paddle board for his wife, Jen. The project tested his novice woodworking skills and his wife’s patience. Not only did she have to wait two years for her paddle board to be made, her car was evicted from the couple’s three-car garage to make way for Shore’s makeshift wood shop. Crazy or not, Shore founded Shore Boards as an extra-curricular business. He honed in on his passion and invented some practices that helped him streamline board production. Last year he produced about 30 boards using a mix of western red cedar, aspen and polonia, a lightweight and light colored wood. With the backing of a “financial angel,” Shore just moved into a 2,400-square-foot workspace in Anoka, MN. Joining him in the start-up venture are two pieces of labor-saving equipment that have quickly become indispensable to the process he uses to make hollow core wood paddle boards. 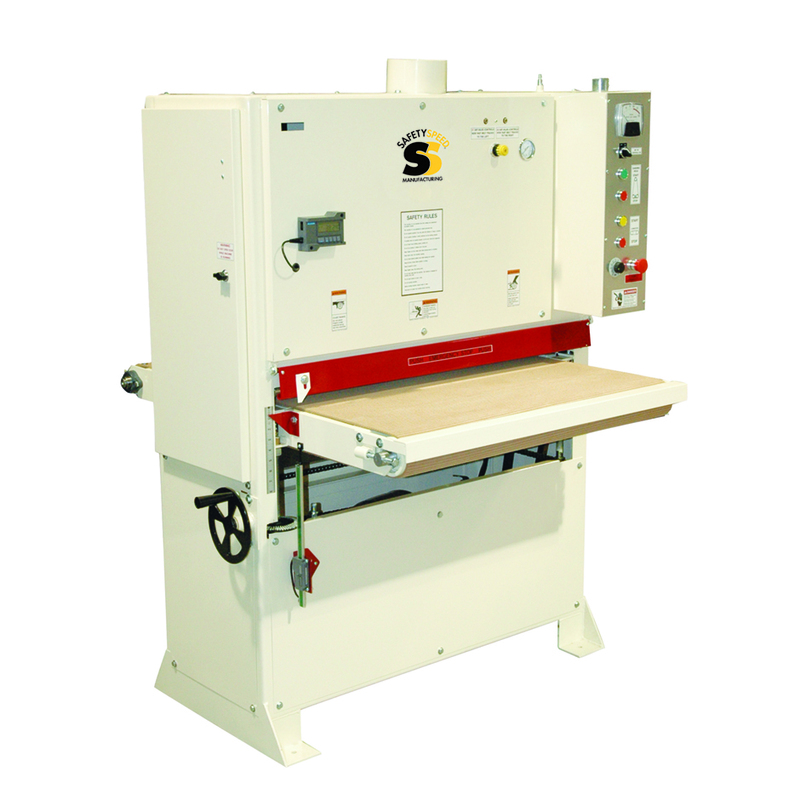 One is a 3760 wide belt sander from Safety Speed Manufacturing. The 37-inch wide belt sander features photo electric belt tracking, pneumatic belt tensioning and rubber-covered pinch and contact rollers. The other new essential machine is an edge and face gluing clamp from JLT Clamps. Both companies are long-time, active members of the Wood Machinery Manufacturers of America. “These two machines combined are literally cutting down the building process by about eight hours,” Shore said. “Basically I’m running the tops and bottoms of the boards through the sander. Before I only had a 13-inch planer. I’d have to do three different panels, each about 32 inches in width. I’d glue each of them up, run it through the planer then edge glue the three panels together. Now I’m able to edge glue the top and bottom designs, clamp the assemblies for up to five whole 32 inch by 12-foot panels on the JLT clamp – which is good for two and a half stand up paddle boards – let them sit for three or four hours and then run them through the wide belt sander. The panels are about 3/8 inch when I clamp them and about ¼ inch after I sand them. The end product is more uniform and precise and the edge glue seams are less visible when I go to add the fiberglass covering. “I knew going into this as a full-time venture that a wide belt sander was my number one purchase,” Shore continued. “What’s funny is that while I was still working as a bank manager last November, I was asked to give a presentation at Safety Speed Manufacturing’s facility. While touring the showroom, the wide belt caught my eye. Learn more about Shore Boards at www.shore-boards.com. 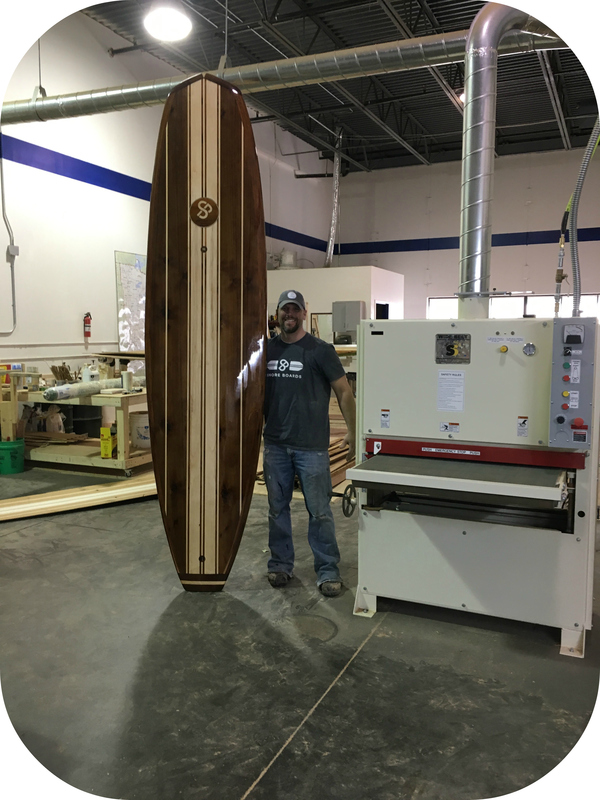 Editor’s Note: Meet Tim Shore and see Shore Board stand-up wood paddle boards at Safety Speed Manufacturing’s booth at the AWFS Fair, July 19-22 in Las Vegas.